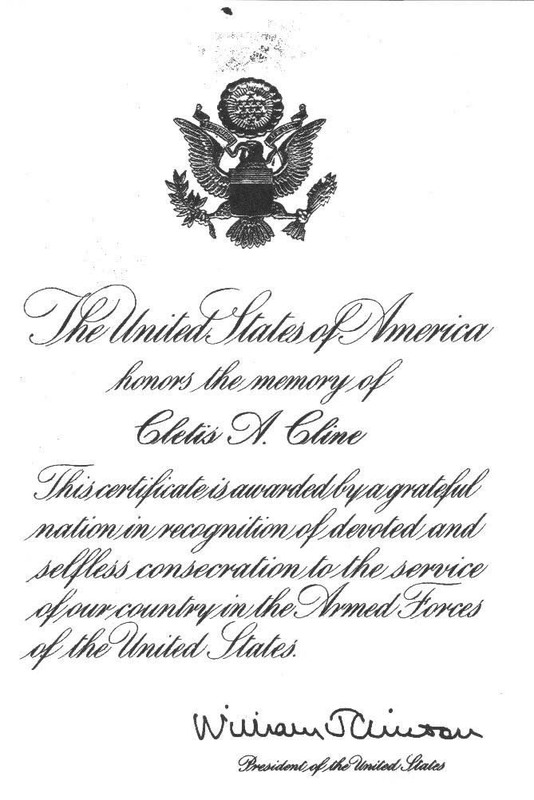 The following is information from Cletis Cline's separation papers. 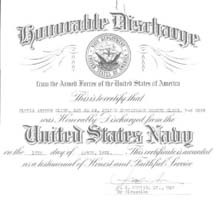 PLACES OF SEARATION: POST DEMOB SEP ACT MARE ISLAND, CALIF.
SERVICE SCHOOLS COMPLETED: CLASS C DIESEL SCH. NORFOLK, VA. 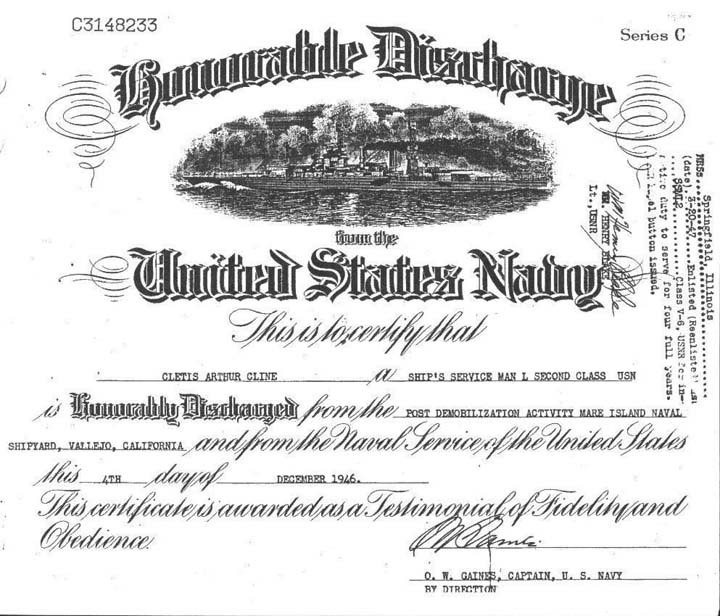 He was at Pearl Harbor on Dec 7, 1941. He was in bed at the time of the bombing, he told me the stories of trying to get out, and trying to save his friends. Even though he did make it he got on one of the smaller boats to go back and try to save his friends and they could not get to them. He also told me he would never forget the sounds he heard of the men still inside tapping on the metal to let them know that they were down there, but them men outside had to face the fact that they could not reach them. 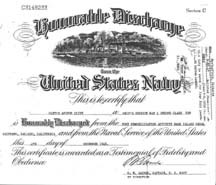 He was also at the USS West Virginia's home base of Bremerton, WA in 1941. I would like to first like to thank the curator of the site for letting me tell my uncle's story and all the help he has given me. 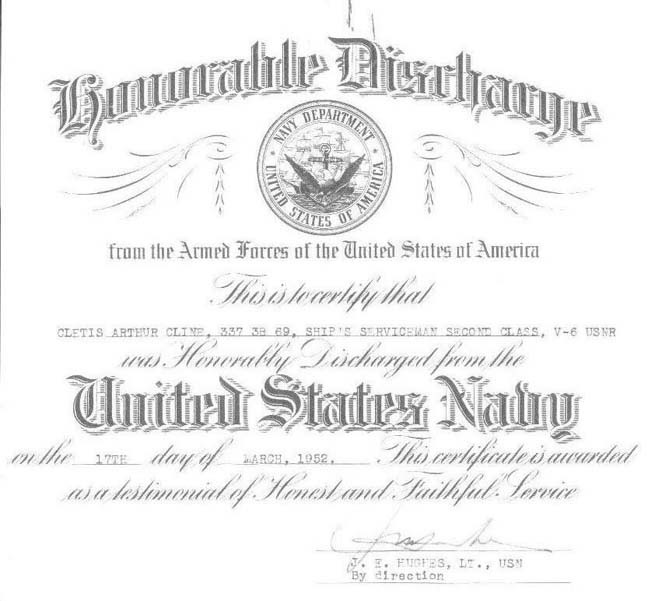 I would also like to thank my father and another uncle for all their help in getting this information. Most of all I would like to thank my Uncle Cletis. Cletis like many others went through something no man or women should ever have to. They did go through it though, and now all we can do is try to tell their stories. No matter what we say about them will never bring them back or change history. Maybe it will do the one thing that is the most important. To make sure no one ever forgets the men and women that lost their lives there on that day Dec. 7, 1941 and the ones that lived on to tell us their stories. The day is over and gone, but it should never be forgotten. When you look at this site and others like this, try and remember the people not just the event. Thank you, Pamela (Cline) Pruitt niece of Cletis Cline. Cletis Cline at a Luau at Barber's Point in December 1991 during the 50th anniversary. 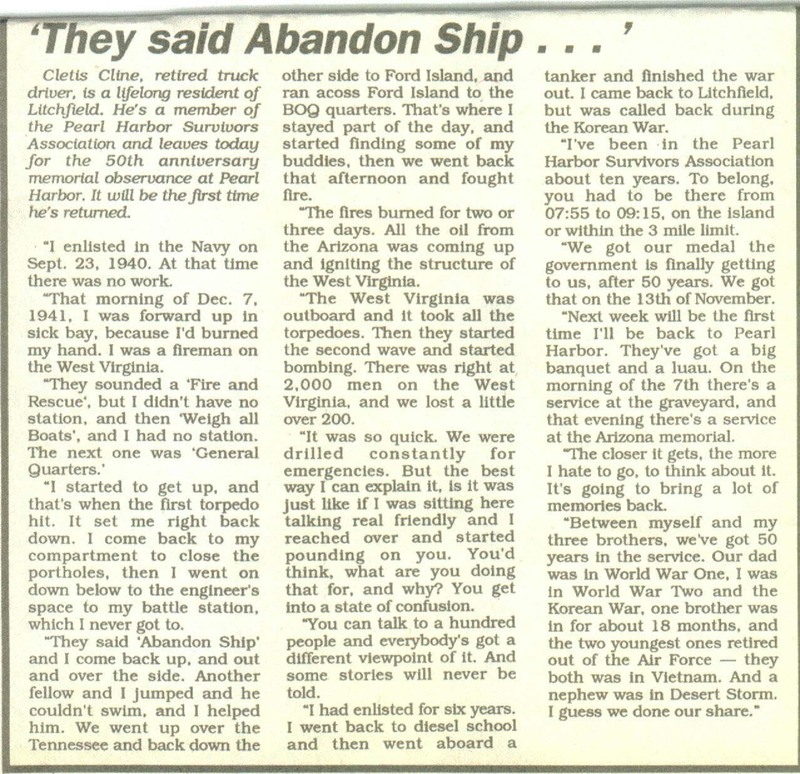 A newspaper article about Pearl Harbor in Cletis' own words. 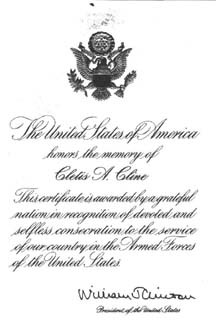 A copy of Cletis Cline's discharge paper after World War II. Click the image below for a larger copy. 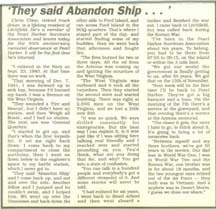 Click the image below for a larger picture.